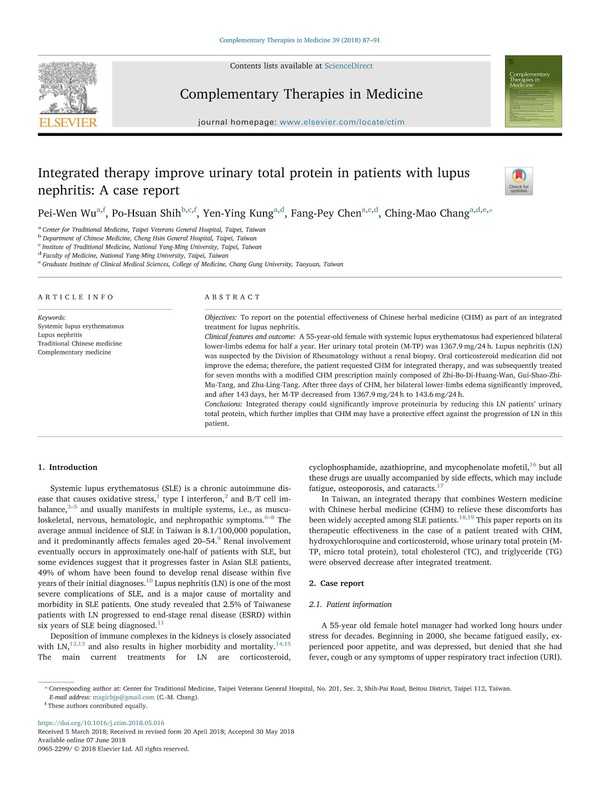 To report on the potential effectiveness of Chinese herbal medicine (CHM) as part of an integrated treatment for lupus nephritis. A 55-year-old female with systemic lupus erythematosus had experienced bilateral lower-limbs edema for half a year. Her urinary total protein (M-TP) was 1367.9 mg/24 h. Lupus nephritis (LN) was suspected by the Division of Rheumatology without a renal biopsy. Oral corticosteroid medication did not improve the edema; therefore, the patient requested CHM for integrated therapy, and was subsequently treated for seven months with a modified CHM prescription mainly composed of Zhi-Bo-Di-Huang-Wan, Gui-Shao-Zhi-Mu-Tang, and Zhu-Ling-Tang. 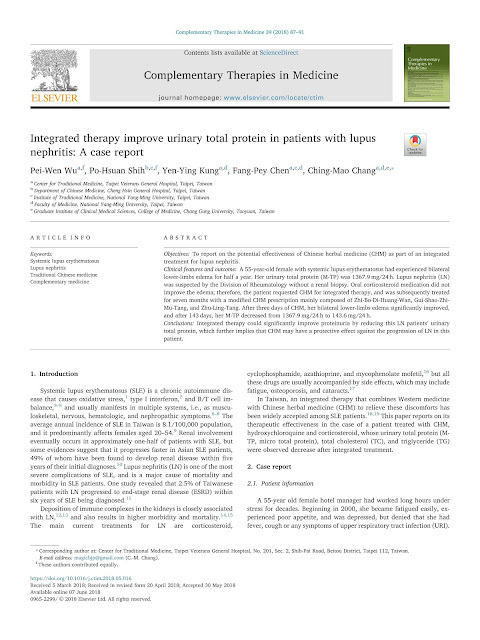 After three days of CHM, her bilateral lower-limbs edema significantly improved, and after 143 days, her M-TP decreased from 1367.9 mg/24 h to 143.6 mg/24 h.
Integrated therapy could significantly improve proteinuria by reducing this LN patients’ urinary total protein, which further implies that CHM may have a protective effect against the progression of LN in this patient.